Cheesecake with Nutella was the first solution that I found that answered my quest for what to cook that is good, but also original, for World Nutella Day? Thus I tried the cheesecake, modifying a recipe found in a book a bit, and trying my luck. The version that I am giving you has been further revised and adjusted, because my cheesecake definitely needed some improvements. First, find a deep baking pan. I said deep, got it? Not like mine, which was too low. If you have one of those ingenious springform pans with the sides that can be removed from the bottom, that's even better. While you are looking for a pan, preheat the oven to 180°. When you have found the baking pan, grease it well and put it in the fridge. Melt the butter and sugar in a small saucepan over low heat, crumble the biscuits (crushing them in a bag will do), then add them to the small saucepan. Distribute this biscuit mixture on the bottom of the baking tray and spread it well. Put the baking pan in the oven for 15 minutes, then remove the biscuit base and let it cool completely; meanwhile, bring the oven temperature to 160°. In a large bowl, add the cream cheese and sugar, and process them with an electric mixer (or with a spoon, if you don't have one) until you have a soft and creamy mixture. In a separate bowl, whisk the eggs until foamy; when the eggs are ready, gently add to cheese mixture. Divide the mixture into two parts, put half of the mixture directly into the cake pan, while add the Nutella directly to the other half and mix vigorously. Now pour the Nutella mixture into the baking pan and try to get a marbled effect by making gentle movements with a spoon in the mixture. Put the cheesecake in the oven and - while you're at it - also place a little bowl of water in there, to create steam; allow it to bake for about twenty minutes. Actually, it will show when it is almost ready, because the edges will raise, and the center will stay a little softer. 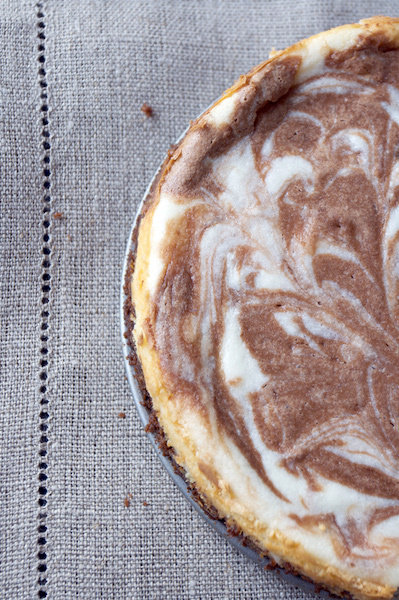 Take the Nutella cheesecake out of the oven and allow it to cool naturally, then put it in the fridge for a few hours. Remove it from the pan only before serving. P.S. Do you want to prepare this inviting cheesecake but don’t want to give in to the Ferrero temptation? You can make Nutella at home by following our instructions!